Legendary Chicago Symphony Orchestra principal trumpet Adolph Herseth has died at age 91. Seemingly indefatigable British maestro Sir Colin Davis has died at age 85. UPDATE: Make that three — pianist and new music champion David Burge has died at 83. The voice of legendary critic and musicologist Deryck Cooke has officially been recovered from the depths of the BBC’s tape archives. 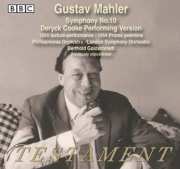 On December 10, 1960, the Third Programme (now Radio 3) aired Cooke’s lecture-demonstration on his first realization (with the assistance of composer Berthold Goldschmidt) of Mahler’s Symphony No. 10 followed by a performance of the near-complete realization by the Philharmonia Orchestra conducted by Goldschmidt. This program has long circulated privately among Mahler enthusiasts. Testament Records has just released a newly remastered edition of the broadcast under license from the Beeb — along with a live Proms performance of the completed first realization (with further assistance from David and Colin Matthews) on August 13, 1964 by the London Symphony Orchestra conducted by Goldschmidt. I’ve just put disc one on the CD player, and can attest to a huge improvement in sound quality over any privately circulated version I’ve run across. I will have much more to say about this release in the next few days. And here’s something else Mahlerites and admirers of Cooke might find interesting.